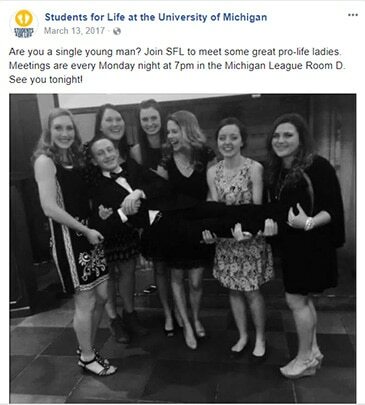 All pro-life organizations ought to have some presence on social media, but there are some common mistakes that can drastically reduce the effectiveness of a Facebook page. Speaking as someone with experience as a Students for Life leader, running an effective Facebook page is not as difficult as it looks. This post will help you see actual results rather than just having your Facebook page sit there as another task on your long to-do list. It just takes some intentionality. If you do not already have a public Facebook page for your group, then you need to create one right away. A Facebook group for your club members to privately chat in is not the same as a page because it does not allow you to develop either a public following or interest in your group. The Facebook page is a public platform that allows people to find you, follow what is happening with your group, and share your posts with their friends. If your organization is just starting out on social media or currently only has a small following, then jumping into multiple social media platforms could spread you too thin. 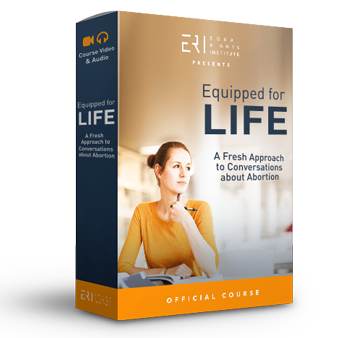 For most local or student pro-life groups, a Facebook page is going to be enough to get started. Don’t make the mistake of setting up a Facebook, Instagram, Twitter, Snapchat, and a blog for your organization if you won’t post consistently on them. For most smaller groups, it will be much more impactful for you to be regularly posting on one platform than sporadically posting across multiple platforms. Most likely, you are only going to be able to offer original content once or twice a week about what you are doing, so you don’t have enough to make it worthwhile for your followers to keep up with you through multiple overlapping social media accounts. If you really feel the need to be on multiple platforms because you think a majority of your audience cannot be reached on Facebook alone, then you should be using a tool like Hootsuite or TweetDeck to streamline publishing. These sites will give you better control by organizing the social media for you. If you are not seeing a steady increase of followers on your page, then you are probably not posting enough. Many people get the majority of their news from Facebook. Unlike email, where most people are tired of getting a flood of information from organizations, social media allows the user to just scroll past a page that posts a great deal, even as often as once a day. Some pro-life leaders think about posting on social media whenever they have an upcoming event or something particularly important happens that they want people to know about. This is a reactionary approach. In this approach, you are only posting when it is most convenient and important for you, not your followers. You need to build the page in such a way that increases the engagement and following of the audience prior to the most important posts so that you will already have their attention when you really need it. Create a goal for posting that is consistent and achievable given your current resources. You may not be a professional in marketing or graphic design, but you can still be intentional in the way you choose what colors or images you use. Communicate to your followers what kind of organization you are through your page. Generally, the more professional a Facebook page looks, the better. For my Students for Life group, we used our school colors in all of our branding. 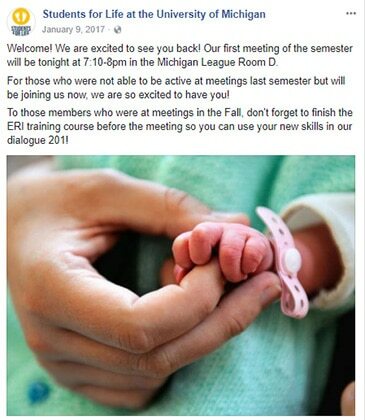 Our logo was a picture of baby feet, which we utilized in our promotion at tabling events and on our Facebook page. When you are creating the page, select a color scheme that you want to use for your group. Colors have psychological effects on how people perceive products and companies. If you are interested in learning more about this, here’s a helpful marketing article on this subject. When you are selecting images, try to be consistent about what you post so that at a glance your page can have a uniform feel to it. You could choose to post pictures that your group takes at events so that the majority of your images are your own, or you could use stock photos to accompany what you are talking about. Here is a good resource for finding stock photos. Some pages are better suited for artistic graphics or memes. It depends on who your audience is and what message you want to send. If you want to create good looking memes or flyers, Canva.com is a fantastic resource. If thinking about branding is overwhelming, don’t let the perfect become the enemy of the good. Connect with other pro-life Facebook pages, especially those of groups that are similar to your pro-life niche or near your location. You should be sharing each other’s important posts so that you can collaboratively build up your audiences. Message any groups that are similar or proximate to you. Start by asking them if they would be interested in partnering with you on social media and ask them how you can help them. Once you have the relationship started, you can ask them to have their members like your page, or even reach out to them when you have an important post you’d like them to share. For example, the Fresno Students for Life group had a professor destroy their pro-life sidewalk chalk and tell them that their public university was not a protected free speech area. They had a video of the incident and wanted to have as many people see it as possible to draw attention to the story. If you have something like this happen and you’ve already built relationships with other groups, then you can start with a much broader audience than you would without the network. This tip is a simple but necessary one to follow. Facebook’s algorithm determines how posts are sorted in the news feed for users. This algorithm changes semi-frequently, but you can generally be sure that any posts with images will have more success in the algorithm than ones without. If you want people to see your posts, use an image. Here is an article on the latest update. Choose an image with either minimal or no text. You can post new images every time or reuse the same ones for particular strategies. For example, you could post the same picture every week of a graphic that says “Meeting Tonight!” or a picture of pizza if you are offering free food as an incentive. When you are formatting and scheduling your Facebook posts, think about what you want your followers to get out of your page. You always want to bring more members to your organization, but you also are looking to have existing members be more active and stay involved. Keep in mind that those people who are not very active members of your organization are unlikely to open and read any emails you send. Your most active members don’t need the reminder every Monday that you have a meeting, but for those who are new or don’t come to meetings, the Facebook post may be what gets them in the door. For this very reason, you should be posting the day of or the night before each meeting and event to alert people. In these posts, you can give them a taste of what will be happening at your meeting. You must include essential details like time and location in each one of these posts. Other goals for your organization may be increasing donations or having external people attend your group’s events. Keep your goals in mind when you are designing your Facebook page so that it has a clear vision. Every time you have an event, you have to take pictures that you can later share online. This will keep any donors you have updated, and it will help people who might want to come your events to know what is happening. If you host an event where it would be possible to record video, then you should do so. If you can, have members write reflections or stories from events, pair them with photos, and create separate posts for each one. Here’s an example of how we did this after one of our outreaches. If all you’re doing with your Facebook page is sharing stories from LifeNews.com, you’re doing it wrong. You can share videos, events, news stories, and other content from outside organizations, but this shouldn’t overshadow the content from your own organization. If the majority of your posts are from secondhand sources, then people do not have good reason to follow you. Followers want to know what your organization is doing, so offer original content about your own events and members. Facebook changes the way it operates fairly often, but at the time of this publication, Facebook is still giving notifications for when pages and people go live. This means that if you film a live video, instead of it being just another item in a follower’s news feed, each person will receive a notification that your page has begun a live video. This is a much better way to get attention immediately. You should go on Facebook Live when you are currently at an important event. When you finish recording, Facebook will give you the option to post the video to your page so that people can view it later. You should give members of your organization recognition for achievements. For some personalities, public recognition is the best way to make them feel appreciated, while others prefer private acknowledgments from their supervisors in the form of a note or small gift. Your Facebook page may be an appropriate place for public recognition for any of the following circumstances: new leaders who have been elected, when a member accomplishes a large task, generally thanking someone for hard work like employee or volunteer of the month, or when someone retires or leaves the organization after leading for a long time. These recognition posts provide additional original content with little work on the parts of the leaders and can simultaneously uplift the hard-working members of the group. Don’t create Facebook events for something small and regular like a meeting, but definitely use them for a larger public event, especially if you’re planning it at least a month ahead of time. If you are hosting a speaker, for example, you would already have a location reserved and details in place far enough in advance so those attending can reserve the date. Have each member of your organization invite at least 100 people, ideally who are in the area and are likely to be interested in attending. Once the event is created, have each member agree to share the post at the same time. This will affect the algorithm to increase the likelihood that the post will be at the top of news feeds for users who are friends or in your area. 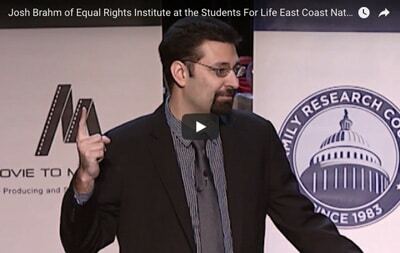 Don’t forget to invite pro-choice friends to events that are geared towards a mixed audience. Many people only think to invite their pro-life friends, but the right kind of event could help someone change their mind about abortion. When there are pro-life events in your area that you cannot attend, you need to select the “Interested” category. This will not only boost the event in Facebook’s algorithm, but it will also help show your support. Select “Going” if you are actually able to attend the event so that the organizers can plan accordingly. The amount of people marked “Interested” or “Going” in a Facebook event can greatly alter the public’s perception of the impact of the event itself. 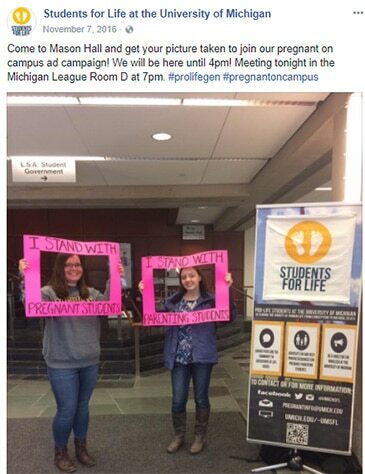 When I was a student, the pro-choice group on my college campus created a Facebook event labeled “I Stand with Planned Parenthood Rally.” Over 1,000 people on Facebook marked that they were going. The day of the event, I expected the location on campus to be packed with students and people from the community. Instead, I was surprised to see only three students running the table outside. The Facebook event had an intimidating number of people who said they were going, but a shockingly small number of people were actually there and asking those walking by if they would take a picture with a sign that said they stood with Planned Parenthood. 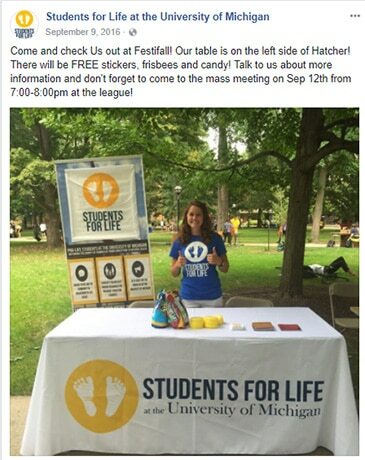 In contrast, the pro-life events that I hosted at my university would often get few responses but decently sized real life turnouts. It shouldn’t be that surprising that not everything we see on social media is consistent with reality. However, public perception of your group is important. I think that this example shows how pro-choice people have been faster at figuring out how to use social media to improve how they are perceived by the public. To ensure social media will be a higher priority for your organization, designate the task of running social media to a specific person on the leadership team. This person will be responsible for posting enough to meet the regular goal, as well as creating a scheduled backlog of content that is ready to be published. Facebook allows page administrators to schedule pre-made posts in advance. This allows the social media person to publish when it is most optimal for the organization, but also lets them accomplish the task on their own time. Multiple people can be administrators for a single Facebook page, so even if you have a designated social media person, you can also allow other leaders to have access from their personal Facebook accounts. This allows them to help reply to messages or assist the social media chair when necessary. Imagine the following nightmare scenario: You have just been handed the reins to a pro-life organization, and one of your jobs is to manage its social media accounts. The last person who was in charge wasn’t organized and can’t remember the passwords because they were just assuming they’d remember. They logged out of the accounts during the leadership transition, and now the passwords are gone. Don’t risk locking your future leaders out of the social media accounts you worked so hard to build up. You should have the passwords and usernames saved somewhere that is accessible to the leaders of your group. When you step out of your leadership role, you should be handing over important information to your replacement and giving them access to everything you control. Some schools have copyright policies for student organizations. Usually something like school colors are fair game, but certain words, phrases, and logos can be off-limits. Check the student organization handbook to make sure you are following any rules specific to your school. 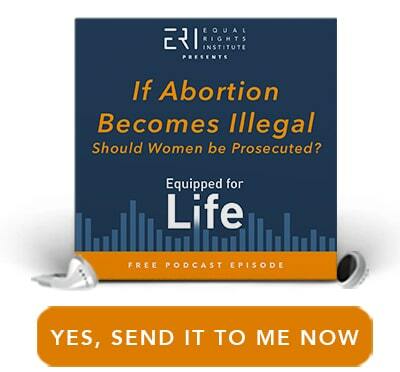 Question: Does your pro-life group already have a Facebook page? What kind of results have you seen from it? Let us know in the comments below! 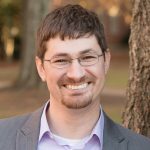 Tweet: All pro-life organizations ought to have some presence on social media, but there are some common mistakes that can drastically reduce the effectiveness of a Facebook page. The preceding post is the property of Rachel Crawford (apart from quotations, which are the property of their respective owners, and works of art as credited; images are often freely available to the public,) and should not be reproduced in part or in whole without the expressed consent of the author. All content on this site is the property of Josh Brahm unless the post was written by a co-blogger or guest, and the content is made available for individual and personal usage. 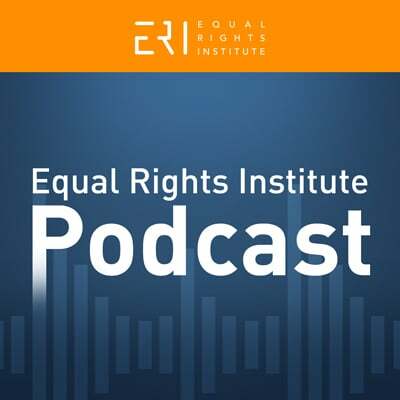 If you cite from these documents, whether for personal or professional purposes, please give appropriate citation with both the name of the author (Rachel Crawford) and a link to the original URL. If you’d like to repost a post, you may do so, provided you show only the first three paragraphs on your own site and link to the original post for the rest. You must also appropriately cite the post as noted above. This blog is protected by Creative Commons licensing. By viewing any part of this site, you are agreeing to this usage policy.